And so it was that I continued my studies about “Art and Fear”, looking further into my own story as it unfolded. I set my sights on beginning, but my beginning held in it more undoing than doing because I saw, after taking off the dust cover beneath the seat, that the twine holding the springs was broken in numerous places. Suddenly the matter of gimp gluing seemed insignificant. 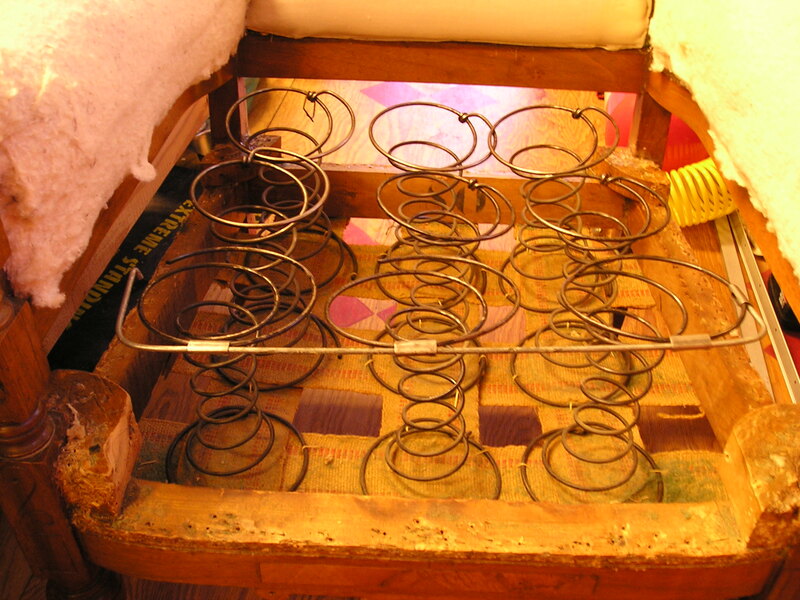 Hoping to ground myself in courage, I went to Google and put in the query “how do I tie springs in upholstery”. Up jumped M.J. Amsden Furniture on You Tube with the most amazing series of tutorials. I watched, I learned and I lessened my dread. Renewed, I continued my deconstruction. Soon it was time for dinner and as I cooked, I let my mind wander. If doing this work is indeed art, then what is troubling me? Is it the long, unexpected hours required? No, I would gladly eat up days making assemblages and never complain. Was it the knowledge that I probably can’t charge for all of my hours on the project? No, this never troubles me as I am making books or learning skills that I might never be paid for. Clearly, the happiness of making art is in the making. As I said before, I must value process over product. But the secret is that I must value it over and over and over again, forgetting all thoughts about payment and bills and deadlines. I must immerse myself. And I must have faith. Determined to do all these things, I returned to the studio after dinner. The night was cold and starlit and had in it the seeds of inspiration. As I worked pulling staples, an eerie thought rose to the surface. The other book I have been reading, “The Wizard of Earthsea” by Ursula Le Guin had just reached the final battle of the hero and the shadow. Ged had been instructed by his master to go toward the fear. “You must seek what seeks you. You must hunt the hunter”. All week I had been riveted, page by page, to see what would happen next, not realizing that the story was my story! And I, like the hero, had to go after the very thing I dreaded. The parallel was electrifying. His courage could be my courage. 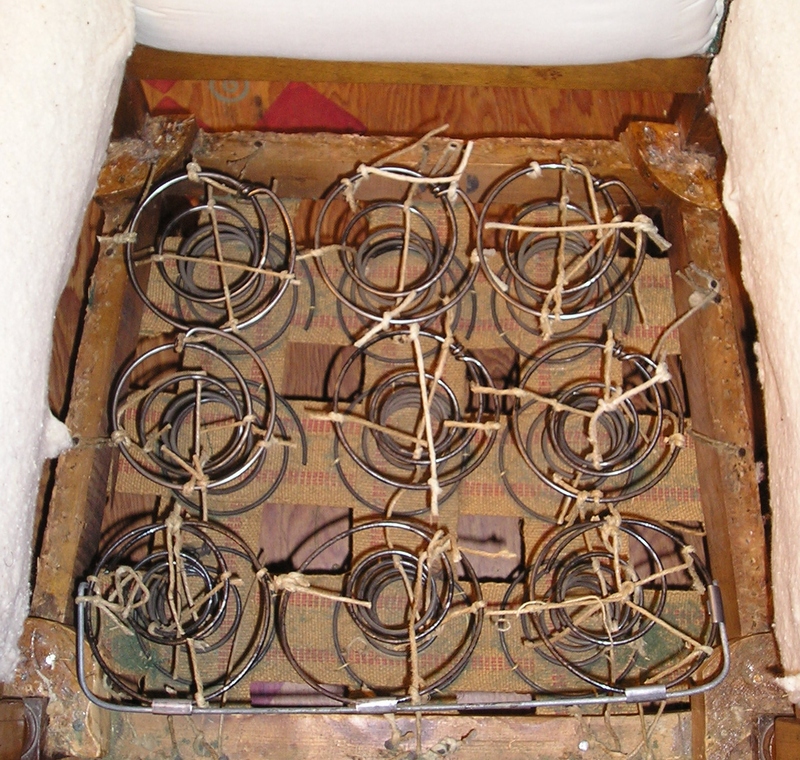 I grabbed my pair of scissors and cut away all of the twine holding the springs in place and set them and myself free. Who ever tied the strings originally made a mess of it. I’d like to see a photo of your artistry once you fix it up right. That’s what I thought! Now that I’ve seen the video of the right way to do it, I am excited to get going. Still a little nervous…I’ll post the finished product when I get there. I enjoyed your posting today and was reminded of that old quote “The journey of a thousand miles begins with a single step”. So many things in life seems insurmountable when seen only from the beginning. I’d love to see your progress on this project. Thanks for that reminder…you are so right about the insurmountable feeling! I know that if I can just get going I’ll start to get more curious and less afraid. I’ll post photos of the progress. i have heard it said ( as a Cheyenne saying, but who knows!) ” what you fear will always find you, accept it, move towards the fear, and it will teach you” sounds like another parallel to your project AND your book! 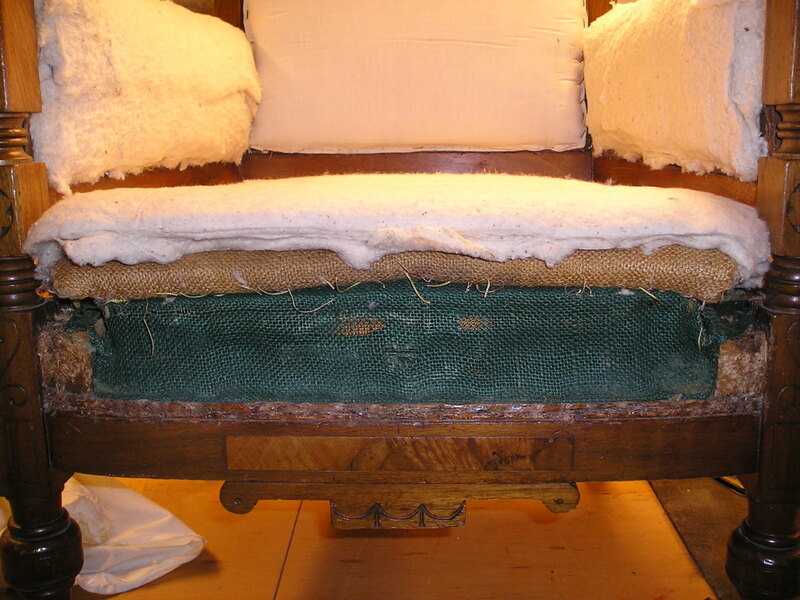 Keep Posting, I am very interested in the whole process, the upholstery job AND the conquering of fears! Jessica – thanks so much for this saying! It’s going to get refrigerator duty right now. My book? You mean the one I am going to write? (am I?) As far as more posts about fear… I can see now that my fear is not going to go away. I am simply going to get better and moving toward it in all its many disguises. 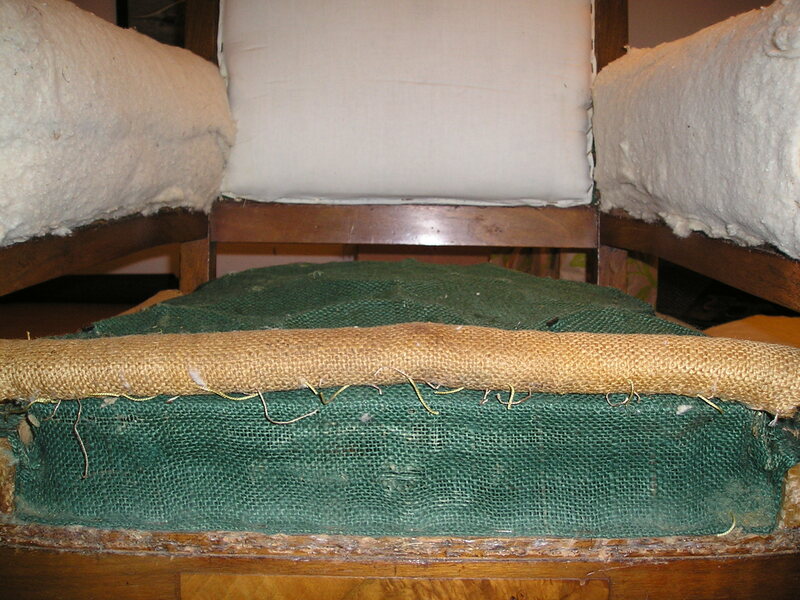 Upholstery job included! !